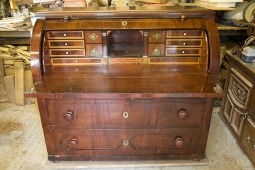 John Farrington - Antique Furniture Repair And Restoration. We offer a full or part repair of both modern and antique furniture, also longcase and vienna wall clocks. From the straight forward repolishing to major reconstruction involving the replacement of broken or missing items. 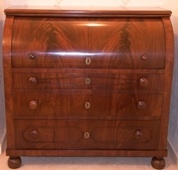 John Farrington has over 37 years of experience in antique furniture restoration with skills that include all aspects of cabinet repairs and french polishing. When it comes to repairing precious antique furniture your decision to trust a particular craftsman is quite unique - all other factors come secondary to their reputation. You're probably looking for somebody with the skill, experience and professionalism to bring your treasured antique furniture back to life. Maybe, you would like to commission the creation of an authentic looking	piece - maybe a chair to accompany your impressive dining table. Frequently, very modern furniture proves not to be economical for the owner to have restored, and it's true... they really don't make them like they used to. That said, items such as tables and chairs can all-too-often become marked - with the repair being both modest and inexpensive to perform. A craftsman's time costs the same amount whether the piece is 300 or, three years old, and only the owner of the piece can decide if aesthetic, financial and sentimental value are reason-enough to employ one of the most respected Cabinet Makers in the Northwest of England. We promise not to compete on price, only professionalism and love for the item itself. Please call or Email for a fair and honest quote today. You will be delighted by the quality of this master craftsman. If you would like a fair and honest quote please Contact us here.